Antifreeze Market size was over USD 4 billion in 2016 and is projected to expand at over 6% CAGR over the forecast timeframe. Antifreeze, popularly known as coolant, is essentially used in automobiles in order to alter the freezing point (in cold regions) and boiling point of coolant (in hot regions) in internal combustion of liquid cooled engines. Thus, inclining automotive sales in Asia Pacific countries including China and India has been one of the most promising growth factor for antifreeze market size in the recent years. In 2016, China accounted close to 30% of the global automotive (passenger cars and commercial vehicles) sales across the globe. Rising consumer spending power and improving lifestyle mainly in India, China, Japan and Indonesia has triggered air traffic, which in turn will boost demand for aircrafts and henceforth will have positive impact on the coolants market size in the coming years. For instance, as per Boeing estimates, airline traffic (revenue passenger-kilometers [RPK]) for Asia Pacific was valued 1,334.2 billion RPK’s and is projected to witness gains at 6.3% by 2033. Crude oil downstream chemicals such as ethylene and propylene are major raw materials in the antifreeze market, thus, oscillating crude oil price dynamics resulting in high price and unstable supply may hamper the overall industry growth in the near future. Additionally, environment regulations against the product owing to its toxicity may also hamper industry growth by 2024. However, increasing R&D initiatives by major product manufacturers to produce products with low toxicity and other value-added feature such as strong corrosion resistance of metal parts will create new growth opportunities in the coming years. Ethylene glycol-based antifreeze market share led the demand and accounted for more than 55% of the global share in 2016. This is mainly due to its excellent properties which includes miscibility in water, ability to be mixed in any proportion to form coolant, etc. Product possess freezing point of 9°F (12.9 °C) and a boiling point of 387 °F (197.3 °C) which makes it applicable as a coolant in automotive industry to maintain the vehicle engine at optimum temperature. 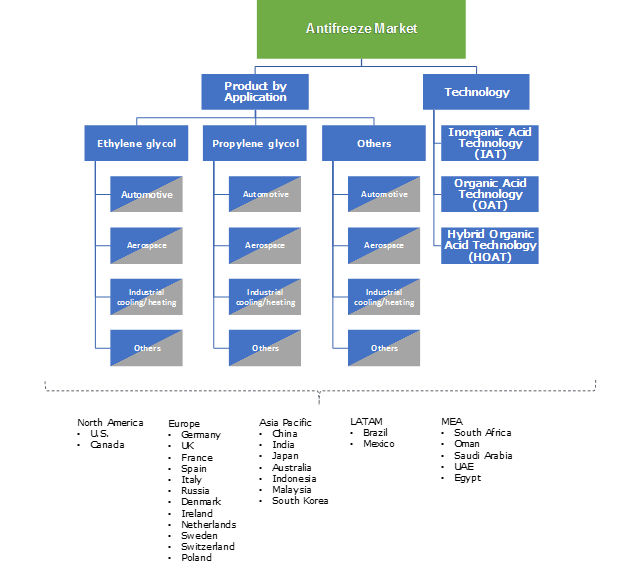 Rapidly rising automotive sector in Asia Pacific, mainly in China and India will make noteworthy contribution to coolants market size over the projected timeframe. Antifreeze market share for Organic Acid Technology (OAT) is anticipated to grow at a CAGR of more than 50% over the projected timeframe. In OAT, the corrosion inhibitors are fully neutralized organic acids and azoles. It is mainly used in light and heavy duty automotive and has extended lifespan which is up to 5 years or 250,000 kilometers for light weight automotive vehicle, whereas for heavy duty vehicle, its lifespan is up to 6 years or 960,000 kilo meters. Additionally, it provides excellent protection to aluminum and magnesium-based engines which are used in modern engines and henceforth makes it desirable across automotive industry. The above-mentioned value adding product properties will help make significant contribution to coolants market size in the coming years. Antifreeze market share for automotive accounted for over 60% of the total business size in 2016. It is commonly applicable in automotive industry to help maintain optimum temperature inside the vehicle’s engine by reducing excess heat which is produced when it runs and thus, avoiding severe damage to its internal component. Product possess excellent thermal capacity, chemical inertness, low viscosity, anti-corrosive and non-toxic properties which makes it desirable for automotive application. Rapidly growing automotive industry in Asia Pacific is attributed to rising socio-economic factors in the region which will subsequently drive product demand and therefore, will have positive impact on the coolants market size in the near future. Asia Pacific led the overall coolants market share and accounted for over 45% of the global volume in 2016. The regional growth is mainly driven by positive growth indicators in automotive, aerospace and industrial sector. Rising aerospace industry in the region is mainly attributed to improving consumer spending power which has triggered the air traffic and henceforth will drive aircraft manufacturing in the near future. For instance, as per Boeing and Airbus, the two-major aircraft manufacturer in the region suggests that Asia Pacific fleet size will triple and reach over 13,000 aircrafts by 2034.This will help attain promising gains to coolants market size in the coming years. Antifreeze market share is consolidated owing to the presence of few large-scale manufacturers. Prominent industry share contributors are Royal Dutch Shell, Chevron Philips Chemical Co., Kost USA, Exxon Mobil Corporation, Total S.A., Ashland Inc, Castrol, PETRONAS, BASF SE, Sinopec Corporation, Dow Chemicals and DuPont. Key industry players are making significant investment in R&D to expand their product portfolio and attain competitive edge over its competitors globally. For instance, Shell Lubricants launched two new range of coolants, namely ROTELLA Extended Life Coolant which is nitrite free and ROTELLA Ultra in February 2015. This move was intended to meet the requirements for rising commercial vehicle segment which prefer nitrite free engine antifreeze formulations to protect aluminum components. Antifreeze, commonly known as coolants is mainly used in automotive, aerospace and industrial heating/cooling system to reduce excess heat generated by bringing down temperature in vehicle engine, machinery components, etc. It possesses properties including excellent thermal capacity, chemical inertness, anti-corrosive, low viscosity and non-toxic properties making it desirable for aforementioned applications. Rising consumer spending power mainly in China and India has propelled demand for automotive which in turn will make significant contribution to antifreeze market size during the forecast timeframe. Additionally, growing population along with improving consumer lifestyle in Asia Pacific has led to rising air traffic which has triggered demand for aircrafts. These trends will have positive impact on the coolants market size over the projected timespan.